When I found out there was going to be a super secret surprise midnight screening of Furious 7 at The Paramount Theater during SXSW, I completely changed my movie watching plans for that day and made sure that I got a great spot in line. I ended up with a fantastic seat in one of the coolest theaters in Austin (although, my heart will always be with Alamo Drafthouse, but I digress). Anyway, I mention all of this because I’m sure it will taint my view of this film. It’s hard to separate a great experience from a film, and boy, was this a great experience. First, producer Neal Moritz came out and explained to us how special this movie was to him. He also asked that we not spoil the fate of Paul Walker’s character. I will most certainly honor that request (although I will say that I think they handled it with a lot of respect) and I will also try to be as spoiler free as possible. Mr. Moritz then introduced writer Chris Morgan, director James Wan and… Tyrese!! So, as I said, this was certainly a great experience and one that I’ll never forget. 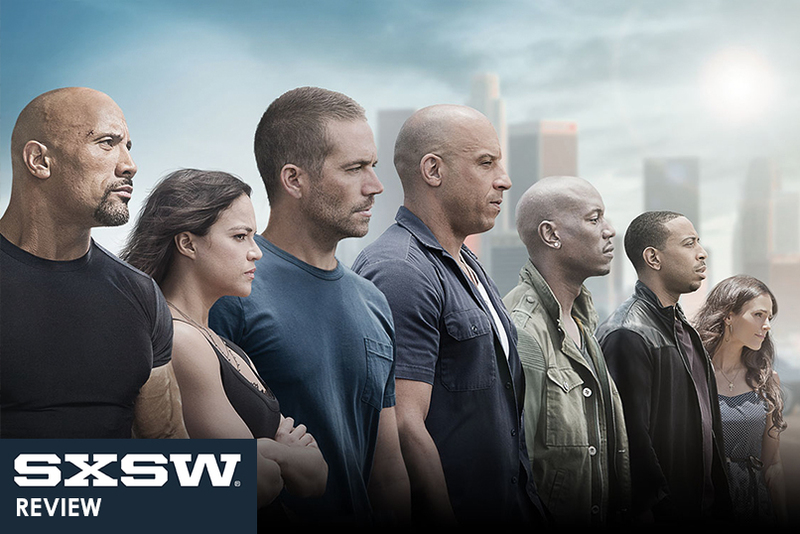 Now, at this point, you already know if you’re a fan of The Fast and Furious films. They’re all ridiculous and over-the-top, but they’re also all extremely entertaining. I think, however, that the best thing the franchise ever did was bring back the cast from the first movie and put them in a heist movie instead of a racing film for the fourth movie. That changed things and made it much more interesting. It also kept the franchise going, because things weren’t looking too good after 2 Fast 2 Furious and Tokyo Drift (even though I really liked that one). Then, they added Dwayne Johnson to the mix in Fast Five and suddenly, this became one of the most successful franchises of all time, despite the insane amounts of absurdity and machismo on display. It was a series that could almost do no wrong. Give credit to director Justin Lin for that because he has helmed the last four of these. For this one, however, there is a new director: James Wan. He is known mostly for directing horror films like Saw, Insidious and The Conjuring and I wondered how all of that would translate to this particular series. Now that I’ve seen it, I have to say that I think he did an incredible job of keeping everything the fans love about the series while also adding his own unique flare to it. His Furious film seemingly takes itself even less serious than those before it and is even more ridiculously absurd. Two men crash their cars head on into each other, completely smashing them, and then get out and shake it off like nothing happened. Then they continue their fight. On foot. This is normal in their world. But somehow, it strikes just the right tone. Every bad line is delivered in just the right way and every camera angle captures the cool action that we all want to see. Everything is perfectly handled and it’s all just a lot of fun. The plot is pretty straight-forward: Vin Diesel and his crew are out for revenge after one of their guys is killed by the brother of the bad guy they defeated in the last movie. Kurt Russell plays a government agent who wants to help them out with their revenge if they’re willing to help him out. So, the crew accepts his offer and travels to many different countries where they have some of the best fight / action sequences of the entire franchise along the way. Jason Statham, Ronda Rousey, Tony Jaa and Djimon Hounsou make up the toughest adversaries they’ve ever had to face. So, those awesome actions scenes plus the overall fun tone and nature of this film definitely put this one towards the top of the franchise for me. I really appreciated that it didn’t take itself serious at all. I’d say if you’re a fan at all, you need to check it out. It comes out on April 3rd and I hope they continue to make more!